Jihadi Groups Win Key Constitutional Points By Danish Karokhel in Kabul (ARR No. 93, 26-Dec-03) Institute for War & Peace Reporting Jihadi groups appear to have won significant changes in the draft constitution of Afghanistan that would increase the authority of Islam in the government, according to key Loya Jirga delegates. They also have made a deal with President Hamid Karzai to decrease the powers of the president as currently described in the proposed document and create a council to interpret and oversee the implementation of the constitution, according to a delegate who represented the jihadi groups in negotiations. Some of the changes were approved by a majority on the Loya Jirga��s coordination committee of 38 members, which includes the chairmen and secretaries of the body��s 10 working committees as well as the elected leadership of the Loya Jirga. The changes in the articles were described to IWPR by Mirwais Yaseni, deputy chairman of the Loya Jirga; Eng. Ahmad Shah Ahmadzai, who is a member of Itihad-e-Islami party and is a Loya Jirga delegate on the coordination committee; and two observers from the commission that drafted the constitution, Shukria Barakzai and Parwin Mohman. Given the large numbers of jihadi leaders and their political allies in the 502-member Loya Jirga, the changes stand a good chance of being approved by the full assembly when they come up for a vote starting tomorrow afternoon. The coordination committee will meet Saturday morning to discuss the elements of the deal with Karzai. Among the most significant changes is one proposed to Article 3, which currently states that "no law can be contrary to the sacred religion of Islam and the values of this constitution". The coordination committee agreed to eliminate the reference to "the values of this constitution" � which includes concurrence with the United Nations Declaration on Human Rights. If the phrase were eliminated, some fear, conservative interpretations of Islam could take precedence over human rights. In addition, the committee voted to change the wording of Article 2, which currently states that "The religion of Afghanistan is the sacred religion of Islam", to read instead, "The religion of Afghanistan's government and people is the sacred religion of Islam". And, in an acknowledgment to the rights of women advocated by many delegates, the coordination committee also voted to specify in Article 4 that the term "citizen" applies to men and women. 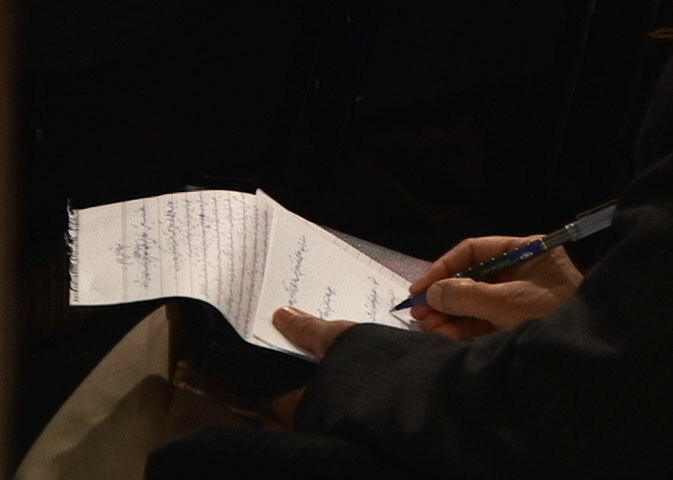 As for the deal with Karzai, which is expected to come up for consideration by the coordinating committee Saturday morning, Siddiq Chakari, a member of Jamiat-e-Islami party who participated in the negotiations, said the tradeoff would mean that the clause in the draft constitution which specifies that the president should be directly elected by the people would remain despite the fact that many in the Constitutional Loya Jirga favoured a parliamentary system, without a president. But the power of the president to appoint ministers would instead be given to the parliament, according to Chakari, who was part of the negotiations with Karzai. In addition, a new article would be added to create the Diwan-e-Aali, or High Council, which would supervise the implementation of the constitution, including review of the new laws passed by the parliament. The council members would be appointed by the president immediately following the Loya Jirga��s approval of the constitution. This addition leaves room for a conservative interpretation of the constitution -- depending entirely on who is selected for the council. Some delegates opposed the creation of this council for that reason. "All the [jihadi] delegates wanted the word `Islam' added to the end of every article," said Barakzai. "They didn't even want a market economy, but wanted `Islamic economy' to be written", she said. She said the jihadi leaders also had been advocating for special rights in the constitution, "but the privileges they were demanding have not been fulfilled". 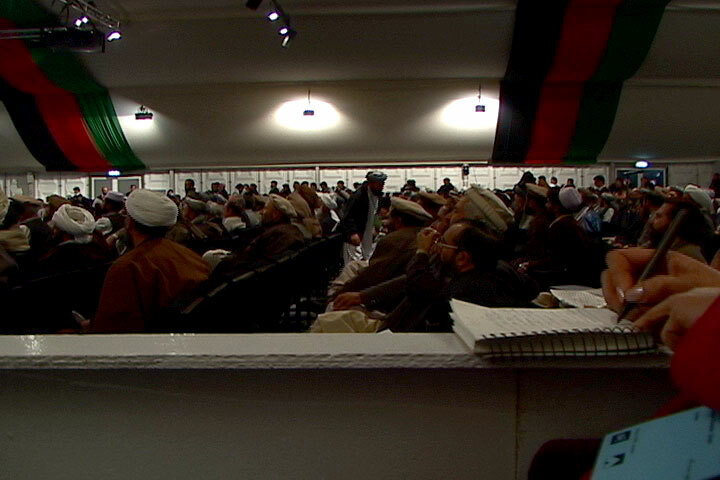 Yaseni said the entire Loya Jirga will have the chance to discuss and approve the changes. "These 502 people have come to make a good constitution for the people of Afghanistan", he told IWPR. "If they want a change in the constitution, they can make this change", he said. Another 22 articles, not yet agreed by the coordination committee, are in contention and will be voted on separately by the entire assembly. These include: * The list of powers of the president, which some delegates want to see reduced; * The powers of the parliament, which would be enlarged; * That the parliament should be elected at the same time as the president, presumably in June 2004; * The official languages, which the draft says are Dari and Pashtu; ethnic Uzbeks have advocated that their language should also be one of the official languages; * The national anthem, which the draft says should be in Pashtu. Some have suggested a new anthem that would be in Pashtu but include the names of various tribes of Afghanistan; * The former king's title of "father of the Nation" and awarding of ceremonial privileges to him. Jihadi groups want to also have some privileges; * That anyone appointed as a minister could not have dual citizenship. The draft constitution only specifies this as a qualification for the president; * The article which allows Shia jurisprudence to be used "in cases dealing with personal matters" between Shias, who are in the minority in Afghanistan. Some delegates feel that only the Hanefi law of the majority Islamic sect should be used. Danish Karokhel is an IWPR editor/reporter in Kabul. Mustafa Basharat, an independent journalist in Kabul participating in IWPR's Loya Jirga reporting project, also contributed to this report. AFGHANISTAN: Women demand clear definition of 'citizen' in constitution Integrated Regional Information Network (IRIN) December 26, 2003 KABUL, 26 December (IRIN) - As Afghanistan's historic Constitutional Loya Jirga (CLJ) continues its deliberations, women delegates - who make up just 20 percent of the 500-member gathering - and local gender pressure groups are pushing for women's rights to be fully enshrined in the nation's new constitution. "The draft constitution and the discussions so far have not been fully supportive to women. This is important in our conservative, male-dominated society," Gulalai Habib, a local activist, told IRIN on Thursday. "Women are outnumbered, our views at the CLJ will always remain a minority," she added, noting that warlords and conservative mujahidin commanders dominated many of the CLJ's working committees. Some women are concerned that although the draft constitution emphasises equal rights for all� citizens, there is currently no definition of "citizen", and that the omission could be used to discriminate against women. Although the draft document states that the nation will abide by the international norms and treaties it has ratified, presumably including those prohibiting discrimination against women, human and women's rights advocates worry that this is not enough. But a CLJ spokeswoman and delegate, Safiya Siddiqi, told IRIN that this was not a point of conflict and that the majority of delegates were agreed that there was no need to define who an Afghan citizen was. "'Citizen' itself means man and woman, we all know this," she noted. Abdul Rabb Rasul Sayyaf, a jehadi commander generally considered to be one of the most conservative delegates to the CLJ, said delegates in the reconciliation committee did not consider the need to further define citizenship. "The issue of citizens was approved as stated in the draft [citizens with no mention of man and woman], " he told IRIN, noting that he was supported in this by all the rights that the Islamic Shari'ah had granted to women. The 50-page draft constitution, which has been a key element of a UN- supervised two-year plan to stabilise the country, envisions an Islamic republic guaranteeing the supremacy of the Shari'ah. The draft says girls and women can attend school, a right they were denied by the Taliban. In an open letter to President Hamid Karzai on 2 December, Amnesty International asked for a clear definition of "citizen" as mentioned in the draft. "There is no clear definition of 'citizen' in the current draft. The constitution should clearly define 'citizen' to mean every Afghan man, woman and child to ensure that the rights set out in the constitution apply equally to all people in Afghanistan,"� it said. Villagers: High Hopes but Few Specifics By Shahabudin Tarakhel and Danish Karokhel in Kabul (ARR No. 92, 24-Dec-03) Institute for War & Peace Reporting Kamila, 45, lives in a village 17 kilometers outside Kabul. She only hears about the Loya Jirga through her farmer husband. But she has a clear idea of what she wants out of the constitutional gathering: a doctor. There is no doctor in her village, Bakhtyar, to treat its several thousand residents. The nearest health clinic is 12 kilometers away. That's why Kamila believes "the Loya Jirga should give rights to women and build schools so that our daughters will become doctors." Like thousands of other villagers - even those who live relatively close to Kabul - Kamila doesn't really know what the current national convention is doing. But many have vague hopes of practical changes a new constitution might bring. Loya Jirga is a familiar term to Afghans because it's been used some 300 years. They've heard about the current gathering on the radio. 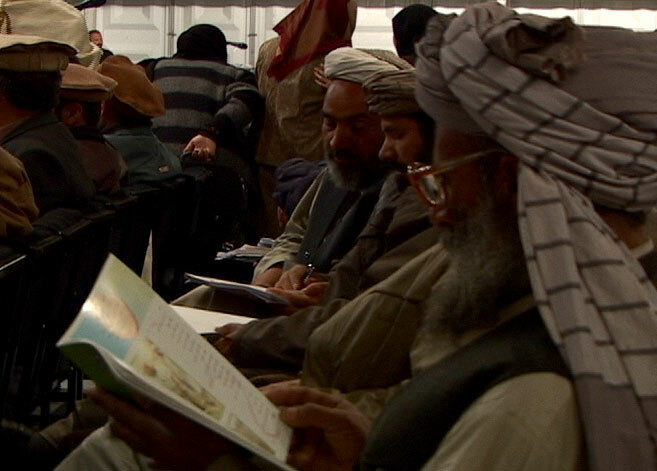 Still, most of those interviewed by IWRP in seven villages around Kabul knew little of substance about the proceedings. One common misperception is that a president is being chosen at this meeting. That's probably because the selection of a president was the main news from the Emergency Loya Jirga of June 2002. The Constitution Commission solicited opinions from 150,000 citizens in 523 gatherings around the country while the document was being drafted last summer. They specifically invited mullahs and elders from the villages, intending that these leaders would in turn educate their villagers, said Abdul Ghafor Liwal, spokesman for the commission. There were also radio programs, a magazine and posters explaining the constitution, Liwal said. But the draft constitution itself wasn't published until the beginning of November, giving little opportunity for it to be read and for convention delegates to get reactions from average citizens. There has been no public education process since about 150,000 copies of the draft document were distributed, other than for media accounts on the sessions. Liwal said they will distribute new copies of the constitution once it received final approval. Even in the best of circumstances, it would be difficult to educate the citizenry, given that many live in Afghanistan's thousands of far- flung villages. In addition, 70 percent of the country��s population is illiterate. It's not surprising, then, that the average villager has only a vague sense of what the current proceeding really means. But they do have a general hope that the session will help solve their major problems, especially in the areas of health care, education and jobs. On the bus to Khak-e-Jabar district east of Kabul, passengers tossed around the idea that the the current meeting would affect prices. They made fun of one passenger who had just bought three sacks of flour: "You shouldn't have bought a lot of flour, it will get cheaper after the Loya Jirga," they advised him. Some simply have a low opinion of the gathering. Zarifa, 33, who lives in Paiminar village about 25 kilometers north of Kabul, has been listening to the proceedings on the radio. She said she is fed up with the delegates wasting time by speaking on issues other than the constitution. Her five children haven't been able to get an education because there are no schools close to where she lives. "In the Loya Jirga, I haven't heard anything that will brighten the future of our country," she said. Education was also a concern for Latifa, a 22-year-old resident of Char Asiab, south of Kabul. She wants the constitution to ensure that girls have the right to attend schools. "Our father and brothers prevent us from going to school because they think that Talebs or other groups will kill them," she said. The constitution draft makes elementary education compulsory for all children. Riza Gul, 50, lives in Bandikhana , about 30 kilometers outside Kabul. She said she hadn't heard anything about the constitution. "People say that there is a jirga in the city, and that [President Armid] Karzai will again become president," she said. Her main concern is to see more jobs created for young people "so they will not create problems for the government," she said. Many villagers did say they're supportive of Malalai Joya, the 25- year-old delegate from Farah province who caused an uproar last week when she called jihadi leaders "criminals" and said some of them shouldn't be in the Loya Jirga. Haji Naim, 44, said the meeting "should create a court in which all warlords who destroyed the country should be put on trial." Danish Karokhel is an IWPR editor/reporter in Kabul. Shahabudin Tarakhel is an independent journalist in Kabul participating in IWPR's Loya Jirga reporting project.